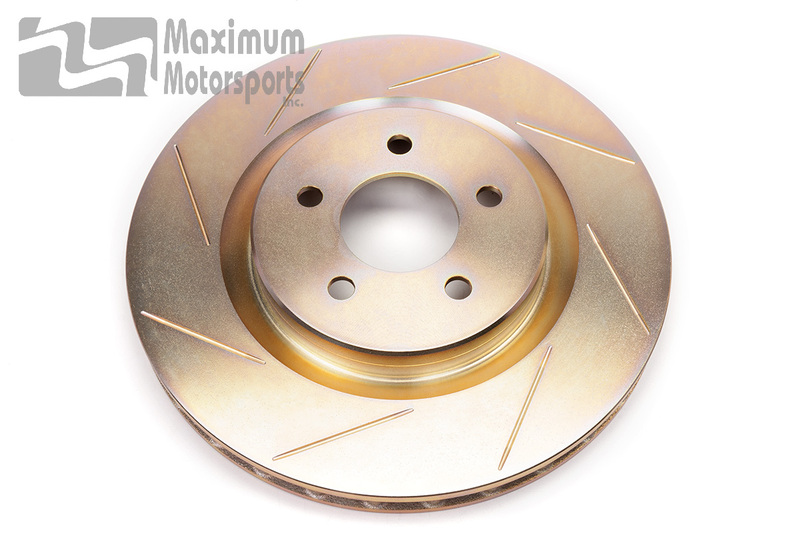 Add the stopping power of the 2000 Mustang Cobra R to your Mustang! Brembo was the supplier of original equipment brakes for Ford's limited production 2000 Mustang Cobra R model. This Brembo brake kit is an excellent choice for street duty and moderate open-tracking, providing increased stopping power, improved brake modulation, and no brake pad taper wear. 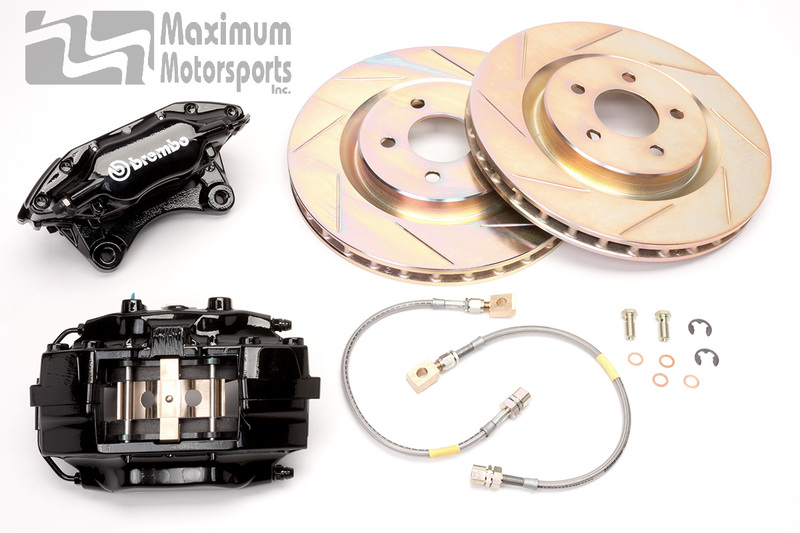 Brembo designed this kit to be a direct bolt-on for the 1994-2004 Mustangs. It may be used on 1979-1993 Mustangs, with appropriate modifications. See below for details. Works best with the OEM Cobra master cylinders fitted to 1994-2004 Mustang Cobra models. 17" or larger wheels required. Wheels must have adequate spoke clearance for the larger-than-stock Brembo opposing-piston caliper. Installation on 1994-95 Mustang GT/V6 cars requires installation of 1994-95 Mustang Cobra master cylinder. Installation on 1996-98 V6 Mustang requires installation of 1994-95 Mustang Cobra master cylinder. Installation on 1999-2004 Mustangs GT/V6 does not require a master cylinder change. Installation of a 1994-95 Mustang Cobra master cylinder on a 1994-95 Mustang GT requires an MMBAK-7 master cylinder adapter kit. Brake fluid is required to bleed the system after installation. Hawk high performance brake pads are available in a variety of compounds. When installing this kit on a 1994-2004 Mustang V6/GT along with the Cobra master cylinder swap, the brake proportioning valve must be upgraded to the Cobra model, or an adjustable brake proportioning valve must be installed and the stock valve disabled. 1994-2004 Mustang spindle. Read the MM spindle swap tech. Rear disc brake conversion. Not compatible with rear drum brakes. Appropriate master cylinder: Typically 15/16" or 1" diameter bore. Brake master cylinder installation kit appropriate to the chassis and the master cylinder used. 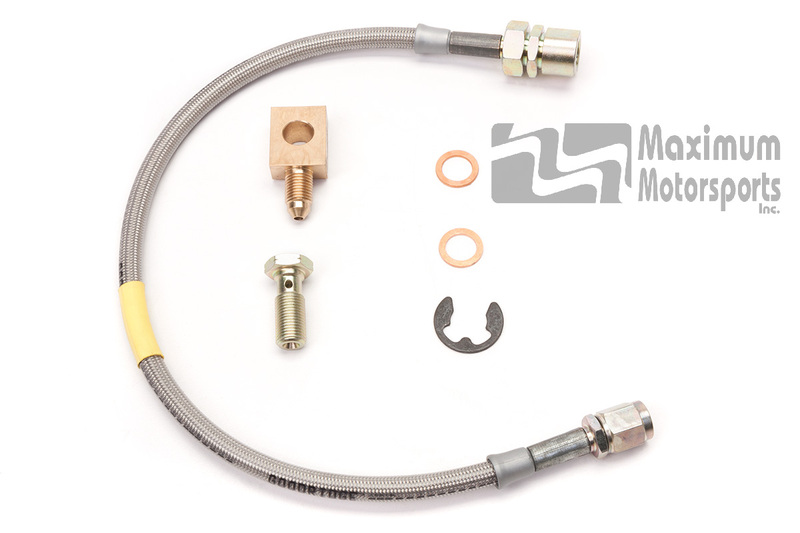 One MMBAK-4 adapter fitting to install the kit's passenger side brake hose on a 1979-93 Mustang brake hard line. 1979-81 Mustangs equipped with 9" front brakes will require two of these adapters. An adjustable brake proportioning valve is required. The stock proportioning valve must be disabled. 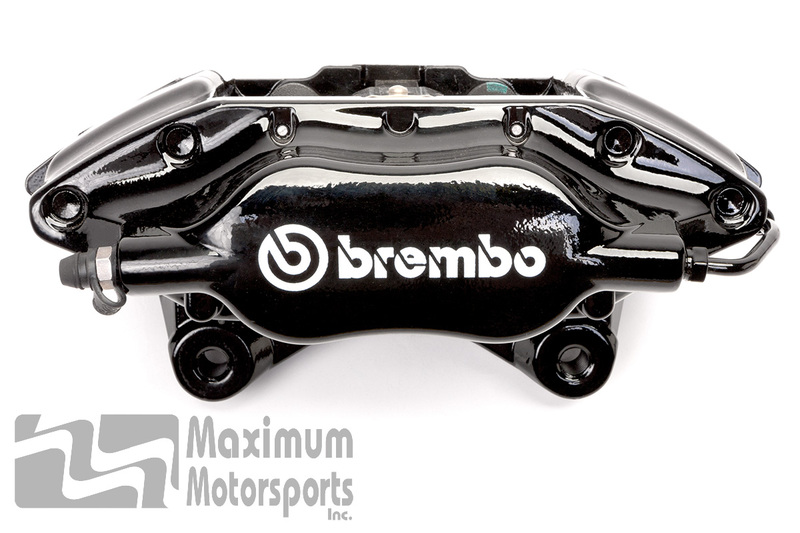 Brembo opposing-piston caliper is much more rigid than the standard Cobra and GT sliding-bridge caliper design. The greater rigidity provides a firmer pedal feel, eliminates brake pad taper wear, and makes modulating the pedal to avoid brake lockup much easier. Gas slots on the rotor faces let the hot gases that build up between the pad surface and the rotor an escape path. That improves the pad's contact area with the rotor and aids cooling. Braided stainless steel hoses eliminate the expansion of stock rubber hoses. That makes for a firmer pedal feel, easier modulation, and quicker brake reaction. 4-piston differential bore design distributes the clamping force over the length of each pad, improving braking ability and pad life by eliminating brake pad taper wear. Opposing-piston design greatly increases caliper rigidity over standard sliding-bridge design. Brembo was the OEM supplier to Ford for all brake rotors installed on the Cobra model from 1999-2004. The rotors in this FRPP kit are dimensionally identical to those OEM rotors. Included are DOT compliant stainless steel braided hose assemblies. 1994-2004 Mustang GT. Cobra master cylinder is recommended. 1979-1993 Mustang with appropriate modifications and upgrades. See the list on the Description tab.